Thanks to Paula, a magical rainbow somehow saves the group from smashing into the ground below. Also, it brings pancakes. Heavenly pancakes. Thanks to his carelessness, Poo is rewarded with a very rare item. Unfortunately for Jeff, this will only prove to be a bad influence on Ness. ...Apparently Jeff isn't quite as reckless as he thought. After a very short attempt at learning to ride, Ness abandons the bike. Actually, he puts it away in his bag. At just the right angle, it fits perfectly! Making their way back to the palace, the group takes a moment to rest. Also, hey, a new subplot! How about that. 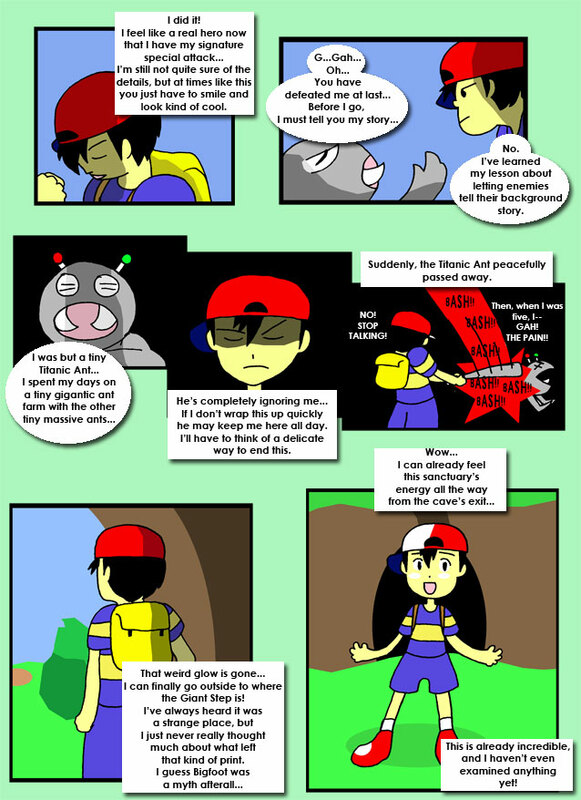 While Poo discovers the history of his bracers, Ness has a very touching reunion with his hat.